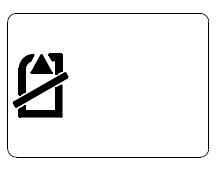 Add "Half-Press" function for the shutter button and improve the "NFC One-touch connection"
* Requires PlayMemories Mobile app version 4.2 or later. The download of the [Update_DSCQX100V300.dmg] file will start. 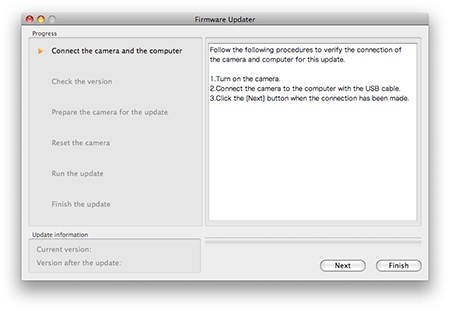 Once the file has downloaded successfully, you're ready to install the Firmware update Ver.3.00 for DSC-QX100. 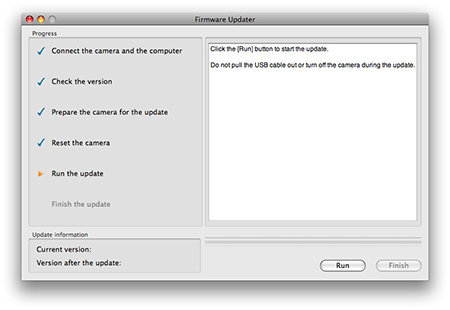 Double-click the [Update_DSCQX100V300.dmg] file you downloaded. Do not connect the camera at this point. 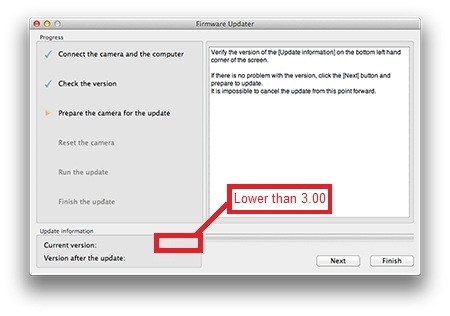 After confirming [Current version] is lower than 3.00, clickNext. 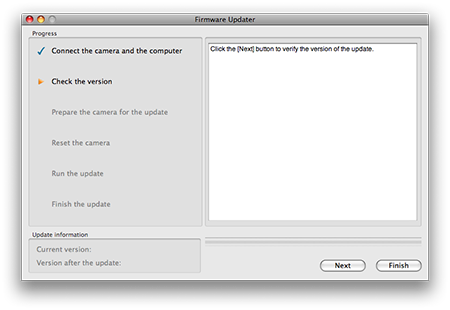 If [Current version] is [Ver.3.00], the update is not required. According to the message, stop the USB connection and click Finish. Turn off the camera, remove the battery pack, reinsert the battery and turn on the camera. 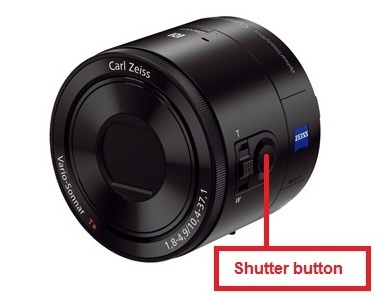 Press the [Shutter] button to execute the reset of the camera. 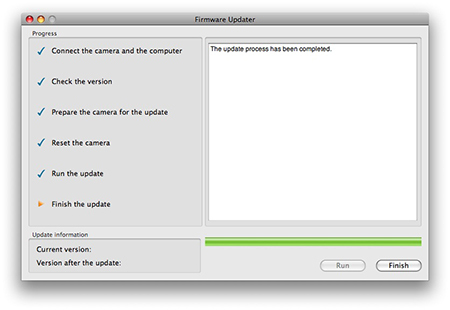 When the update is completed, the screen on Figure 6 appears. Click Finish and disconnect the USB cable. 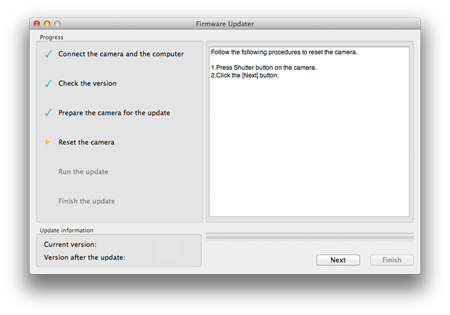 Step 2: Confirm the firmware version of your camera is Ver.3.00. Connect your smartphone or tablet and camera using the PlayMemories Mobile app (version 4.2 or later). 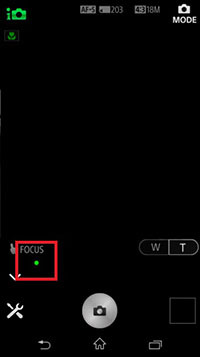 Press the [Shutter] button halfway to focus. 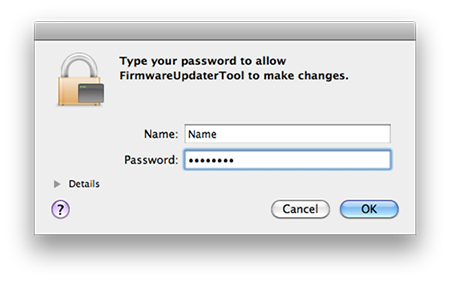 If a green mark is visible (as shown below) then the firmware version is Ver.3.00.